Titans receiver Kendall Wright (85 catches, 1,007 yards, two TDs) has tallied six-plus receptions in five of his last six games. 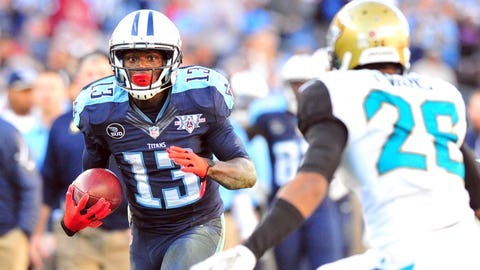 NASHVILLE, Tenn. — With two games to play and no chance of making the playoffs, the 5-9 Tennessee Titans are trying to figure what went wrong while losing seven of nine games, spoling a 3-1 start. The four-win Jaguars, on the other hands, are trying to build on what went right while winning four of six games after an 0-8 start. Third-year Titans coach Mike Munchak could well be coaching to save his job; first-year Jaguars coach Gus Bradley could well be laying a foundation. So it goes for these AFC South rivals as they meet in Jacksonville with similar records, but carrying distinctly different feelings about how the 2013 season has played out. Each coach points to their first meeting — a 29-27 win by the visiting Jaguars on Nov. 10 — that sent the teams headed in different directions down the stretch. In fact, the Jaguars, who finish the season a week from Sunday at Indianapolis, hope to finish ahead of the Titans in the division and would own the tiebreaker with another win Sunday. "I think they have confidence," said Munchak, whose team is 0-4 against division rivals this season and loser of nine out of 10 overall. "They’re 4-2 since we played them, and we’re 1-5. That tells it all right there. A lot of games we should have won that we didn’t." Bradley, the former Seahawks defensive coordinator, agreed that finally getting a win over any team, much less the Titans, was sorely needed at the time considering the 0-8 start. Then again, these division foes have split games each of the past seven seasons, and the Titans hold a slim 21-17 overall lead in the series against their longest-standing division rival. "I think that win against Tennessee just helped us along in the process, helped us validate what we were doing," Bradley said of the first meeting. "The players were great throughout, but I think it gave us a little validation as far as how everything was falling into place just like we anticipated." In that game, the Titans lost starting quarterback Jake Locker for the season with a foot injury. His replacement, veteran Ryan Fitzpatrick, has gone 1-6 as a starter, with the only win being a 23-19 victory at Oakland on Nov. 24. Then again, only one of the team’s last five losses has been by double digits, and they fell 37-34 in overtime last Sunday to visiting Arizona despite Fitzpatrick passing for a career-high 402 yards and matching a career-best with four touchdown passes. But he also threw two costly interceptions â one returned for a touchdown late in the game and the other halting a potential game-winning drive in overtime. "I wish he would (have a better record) because then I’d have a better one," Munchak said of Fitzpatrick, who has a 26-49-1 career record as a starter. "For all these guys, for the team in general, I know the record is what it is now and weâre not going to make the playoffs, but for us it is important to win these two games (including the season finale at home Dec. 29 against Houston), for him to win it, for everyoneâs confidence. "The fact that he’s playing hard, heâs trying to do the right thing, he has come in and really done a nice job, and I wish he would have a few more wins, which would be these next two games." Fitzpatrick has found a comfort zone with second-year receiver Kendall Wright, who notched career highs against Arizona with 12 catches for 150 yards. He ranks seventh in the NFL with 85 catches, tied for the league lead with the 49ersâ Anquan Boldin with 29 third-down catches and 17th overall with 1,007 receiving yards. It doesnât make you work less," Wright said of his numbers this season that include being 16 receptions behind the franchise record of 101 for a season set by Charlie Hennigan in 1964. âI still got to be the best I can be and get better wherever I can get better." The Titans also regain the services of rookie receiver Justin Hunter, who was inactive last Sunday because of a violation of team rules. In two of three previous games, he had eclipsed 100 receiving yards and ranks second on the team with four touchdown catches. "He was in on the run plays and he took some actual reps although the tempo was slowed down," Bradley said of how Jones-Drew looked today during a no-pads practice. " … We need to see you where you made tremendous progress over the last couple of days." If Jones-Drew canât go, the Jaguars will again turn to backup Jordan Todman. After playing only one game for the Jaguars last season after briefly being on the rosters of Minnesota and San Diego in 2011, the third-year pro filled in nicely last Sunday against the Bills, rushing for a career-high 109 yards on 25 carries and also catching four passes for 44 yards. "Well, he has done pretty good for us," Bradley said of Todman, a sixth-round draft pick in 2011 out of UConn by the Chargers. "Obviously, Mo Jo (Jones-Drew) is our back. To keep him strong throughout the game, we wanted to get Todman some reps.
"That was really our mindset going into it, even if Todman could get six or seven reps. We didnât know how he would be, if he got more than that." The Jaguars are also missing leading wide receiver Cecil Shorts, who is out for the season after suffering a sports hernia a week ago Sunday in the win over visiting Houston. He leadss the team with 66 catches for 777 yards and three touchdowns. "Anytime you have a receiver that has over 60, 70 catches at this point in time, that does (hurt)," Bradley said of losing Shorts. "That does affect you at times with our team, but we look at it as it has been a great opportunity for some of our younger guys, too." While both teams need to win to close the season strong for a variety of reasons, the fact that second place is on the line within the division does mean something, especially for the Jaguars after their 0-8 start. "It would definitely be a great feature from what we’ve been last year," Jaguars quarterback Chad Henne said of last yearâs 2-14 record. âIf we can end up these two games with a win, you never know what happens. This league is crazy, but we feel like we got better from last year and this whole year." The Titans also feel they are better this season than last year’s 6-10 debacle, but they might not have the record to show for it unless they can win these next two games and climb back to finish a respectable 7-9. "I think right now any win weâll take it, any way it comes," Munchak said. "We just want to finish these last two with wins. We think weâre capable of winning a lot of games. I felt there were games we should have won by a lot of points.
" … There’s no excuse to not have a division win. What we can accomplish these next two weeks is get two division wins."